The past few years have been tumultuous for the entire recycling industry, as 2018 comes to a close we are left with warehouses filled with unwanted (but collected) recyclate, high contamination rates, recyclate being dumped in the landfill, and more recycling facilities closing their doors as profits dwindle. This is a bleak outlook for recycling if we continue with “business as usual”. Fortunately, some communities are taking a stand against the misdirection pushed by mega brands across the globe. These communities are changing the conversation in an effort to save recycling. 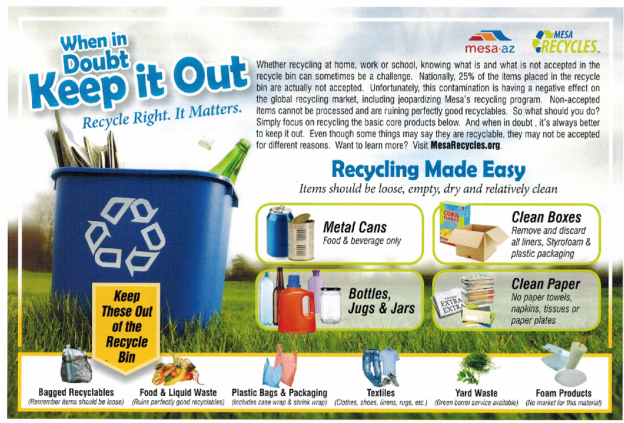 Cities across the nation like Mesa, AZ and Akron, OH recognize that one of the most impactful decisions a consumer can make regarding the recycling industry, is not what should go in the recycle bin but more importantly what should NOT go in the recycle bin. The message is clear “When in Doubt, Keep it Out” – only put metal cans, clean boxes, bottles, jugs, jars, and clean paper in the recycle bin. ANYTHING ELSE BELONGS IN THE TRASH CAN. The key is to reduce contamination in recycling so that recyclers can be profitable and the environmental value can be maximized. Without this, the recycling industry is destined for failure. Interestingly, this move is contrary to what many mega brands have as their sustainability goals and are marketing to consumers. These brands haphazardly slap the words “recyclable” on everything from candy wrappers to coffee pods – none of which should ever go in your recycle bin. Companies that label their unrecyclable packaging with the term “recyclable” are a major cause of the collapse of recycling. They prey on consumers desire to help the environment, while causing the opposite. Any company looking to effectively address waste must consider where their product should be discarded and how it can create maximum value. While this may mean keeping the recycling message on select products, it also means considering other solutions that provide value such as conversion to energy for the vast majority of products. And, communicate honestly to consumers – stop asking them to put unrecyclables into their recycle bin. This entry was posted in Uncategorized on November 30, 2018 by Teresa Clark.